Evangeline and John Nelson Bergstrom on the lakeside lawn of their home, which later became the museum. 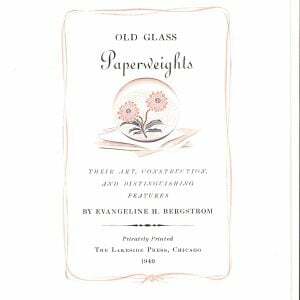 Evangeline Bergstrom began her love of paperweights as a child. She was born in Ithaca, NY on May 23, 1872 and was the only child of Dr. and Mrs. George W. Hoysradt. During frequent summer visits to her grandmother’s home, she became captivated by a paperweight kept on a table in the parlor. Being able to look at the weight served as young Evangeline’s reward for practicing her piano lesson or reciting a poem. She spent much time studying the beautiful patterns and colors. Years later after her grandmother had passed and the family was disassembling the home, Mrs. Bergstrom searched for the paperweight as the one item she desired as a remembrance of her grandmother. Unfortunately, the weight was lost, but she never forgot it. 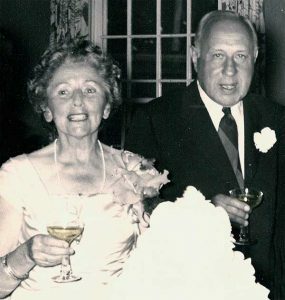 Mrs. Bergstrom met her husband, John Nelson Bergstrom, while both attended school in Ithaca, NY. Mrs. Bergstrom attended the Anna Brown School for Girls and he studied at Cornell University. Mr. Bergstrom was a native of Neenah, Wisconsin and was born there in 1874. Mr. Bergstrom was the eldest of six children, John Nelson, Willis, Diedric W. II, Nathan, Frank and Marie. The Bergstroms married on June 12, 1901 and moved to DePere, WI. In 1904, he and his father, Dedric, founded the Bergstrom Paper Company. The Bergstroms moved to Neenah and resided there for the rest of their lives. The Bergstroms were childless, and so they devoted their time and treasure to several interests in the community including church activities, and historical, horticultural and educational hobbies. Her colonial ancestry afforded Mrs. Bergstrom active membership in the Mayflower Society of Massachusetts, Colonial Dames of Wisconsin, Daughters of the American Revolution, and Antiquarian Society of Wisconsin and the Historical Society of Wisconsin. She also visited frequently the East Coast and wintered in Florida. During one of these winters, in St. Petersburg, Mrs. Bergstrom acquired what we believe to be her first paperweight. On her way to a stamp exhibition Mrs. Bergstrom notice a sign for an antique show. She ventured in, and there she discovered a weight similar to the one her grandmother owned. It was marked with a B and an 1847 date, which later she learned stood for Baccarat. She purchased the Baccarat weight and one other- what she called a Fowlerton piece, which records indicate was a Whitefriars Inkbottle. The year was 1935, she was 63 years old, and from that time on she acquired any weight that attracted her. Within a short time, Mrs. Evangeline Bergstrom became an expert in antique paperweights. Her collection was exhibited at The Art Institute of Chicago, 1939. More than 200 weights were displayed. Mrs. Bergstrom appeared on a WGN Chicago radio talk show on November 24, 1942, after photos of her collection appeared on cover of Hobbies Magazine. Requests continued for showings of the Bergstrom collection. These included the Neville Public Museum in Green Bay, WI in 1939, the Milwaukee Art Institute in 1940 and a plea from the Milwaukee Public Museum in 1949. Fan mail poured in as personal letters sent to Mrs. Bergstrom thanking her for sharing the collection with adoring enthusiasts. By Fall of 1940, pre-publication information was released on Mrs. Bergstrom’s self-published book on glass paperweights from her own collection and research. It was one of the most authoritative references of the time. Publishers, authors, collectors and enthusiasts of all types were taken with the beauty of the publication and the manner of its writing. The American Library Association included it among three recommendations for their Christmas gift picks. Accolades also came from other noted collectors: Dorothea Yaeger, with the highest regard for a fine work, and Jennie Sinclair who closed her correspondence with, “I hope one day I have the privilege of seeing your fine collection”. 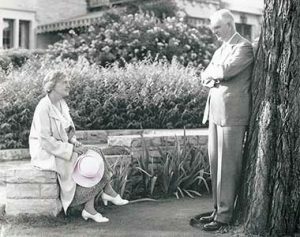 Evangeline’s husband, John Nelson Bergstrom was able to see his wife rise to this level of expertise, and was instrumental in preserving Evangeline’s efforts primarily between 1935 and 1944. He did not live to see the museum to fruition. Upon his death on June 19th 1951, John Bergstrom left a substantial sum of money to the City of Neenah to be used for a museum. In 1953, Mrs. Bergstrom gave the Tudor mansion she and her husband built in 1929-30, to serve as the site for a museum. In 1954, Ernst Mahler was elected chairman of the effort to found the museum. Other founding member included Evangeline Bergstrom, Carol Mahler, Mayor Carl Loehning, Mrs. Jessie K. Clark, Mr. and Mrs. S. F. Shattuck, Mr. and Mrs. J.C. Kimberly, Miss Helen E. Babcock, Miss F. Elizabeth Babcock, Mrs. H. E. Babcock, and Mr. Arthur P. Remley. Mrs. Bergstrom passed away in February 1958. On April 5, 1959, the John Nelson Bergstrom Art Center opened to the public. Today Bergstrom-Mahler Museum of Glass is operated and the glass collections are cared for by a private foundation, Bergstrom-Mahler Museum, Inc. The museum leases the building from the City of Neenah. In an effort to meet the needs of its growing public, museum expansions took place in 1965, 1986, and again in 1997. Bergstrom-Mahler Museum of Glass now greets more than 20,000 visitors each year. The museum glass collection numbers over 3,500 objects and is revered in glass collecting communities worldwide. Mr. Ernst Mahler grew up in Vienna, Austria. In 1914, he immigrated to the US and took a position with Kimberly-Clark Corporation in Neenah. A distinguished scientist and executive, Mr. Mahler developed the process of making cellucotton, an absorbent cotton wadding from processed wood, which was used to bandage wounds during World War I and later in feminine hygiene products and disposable diapers. Mrs. Carol Lyon Mahler was from Minneapolis, MN. As the story goes, on a January afternoon in the early 1930’s, the Mahlers were on the train to Chicago when Mr. Mahler announced that one of this appointments the following day was to check on the arrival of Mrs. Mahler’s Christmas present. Mrs. Mahler took this as a joke as Christmas was past and her stocking had been well filled. Mr. Mahler explained that during the Fall before, he had purchased a Germanic glass collection in Vienna, known as the Kurz Collection. He had planned this as a very special Christmas present for her, but due to shipping delays, the glass had not cleared US Customs until the previous week. To understand Mrs. Mahler’s acknowledgment of this gift, we must remember she admits she knew nothing about Germanic glass as produced by artisans. If she classified it in any way, it probably fell in the category of beer steins. However, when the glass was unpacked and Mrs. Mahler viewed the fine craftsmanship of the collection, it was love at first sight. Through the years, it became hard to distinguish who was the greater enthusiast—Ernst or Carol—as the collection was cherished and shared by them both. Mr. Mahler worked out plans for the museum with Mrs. John Bergstrom during her lifetime and was founding president of the Board of Directors until his death in 1967. Mrs. Mahler was also interested and involved in the museum’s developments. She served on the Board of Directors and was Chairperson of the Board for several years.